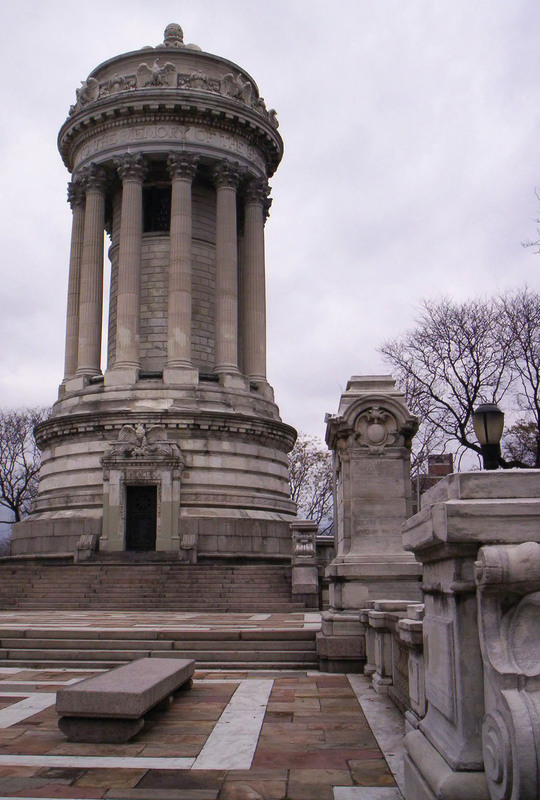 Manhattan’s Soldiers’ and Sailors’ Memorial was unveiled on Memorial Day 1902, the work of architects Charles (1860–1944) and Arthur Stoughton (1867–1955). It consists of a particularly beautiful 96-foot-tall, circular, white-marble temple that is ringed by a colonnade of a dozen Corinthian columns and guarded by two cannon. Originally this “Temple of Fame” in honor of the Civil War dead was to be located in Grand Army Plaza on Fifth Avenue at 59th Street, where the Pulitzer Fountain stands today, but city officials later selected this spot instead. Around the top of the monument are carved the words, “To The Memory Of The Brave Soldiers And Sailors Who Saved The Union.” The memorial also displays the names of Farragut, Sherman, Porter, and others, along with the names of battles in which New York regiments saw action. Thanks for this post, Bill Morgan, and A Civil War Blog for providing a platform to continue this discussion. Your post provides valuable insight into the unique Soldiers’ and Sailors’ Memorial. We look forward to seeing the final two posts about the Civil War in New York City. Previous post: Sharpshooter Glasses – Or Sighting for Sore Eyes?